Portlanders...if you're in the PDF sewing world, chances are you've heard of them...after I started sewing for myself, I heard them mentioned here and there, but didn't pay much attention...but then New Horizons came out with Portlanders for Girls. My littles needed new shorts, so I was more than happy to test and give them a shot. They are such a quick sew, and so cute to boot! I made 4 pairs for my girls during testing, and we've enjoyed them thoroughly! Not too long after, the ladies Portlanders added a shorts cut line, and as it was blazing hot here, I was more than happy to sew up a few pairs. It gave me the chance to give reverse coverstitching on my pockets a go...I used a tip I read somewhere to sew a basting stitch just outside the pocket edge and use it as a guide when sewing the pockets on (from the wrong side)...and it worked like a charm! I was so pleased with how it turned out! Now the Ladies Portlanders have gotten a little update...instead of lettered sizing (8 sizes) there is numbered sizing (14 sizes) that extends to 26! Some people fell between sizes previously (XL was 16-18) and this will help provide a better fit. The crotch curve was also slightly adjusted. I tested size 16 and got a great fit - the only adjustment I made was hemming at 1.5" instead of 1". 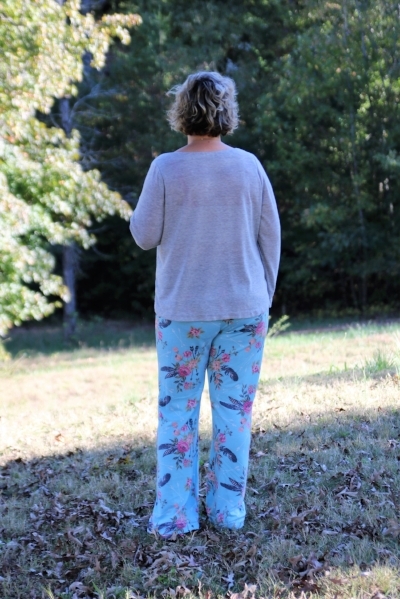 I used beautiful French Terry from So Sew English and dbp from Simply by Ti for the waistband, and I absolutely love them. These replaced my old maternity pj pants and will be worn time and again! And my sweet 8 yo has already requested her own pair...clearly I need to get sewing! If you'd like to pick up the pattern, don't forget that the Ladies and Girls' patterns are available separately, or in a bundle! On sale through 12/27/17 with code HOLIDAY - 40% off! This post contains affiliate links, that if used, at no cost to you, will provide a little extra $$ for my love of fabric and sewing. Thanks so much!